"The wolf shall dwell with the lamb, the leopard shall lie down with the young goat, the calf and the lion and the fattened calf together; and a little child shall lead them. The cow and the bear shall graze; their young shall lie down together; and the lion shall eat straw like the ox. The nursing child shall play over the hole of the cobra, and the weaned child shall put his hand on the adder's den. They shall not hurt or destroy in all my holy mountain; for the earth shall be full of the knowledge of the Lord as the waters cover the sea." The scene has often been portrayed by artists, not least Fritz Eichenberg, the German-American refugee from Nazism, from one of whose versions of the scene (see PT 5 ) the cameo on our masthead is derived. Other favorite renditions are those of William Strutt, 1896, and the many by Edward Hicks early in the nineteenth century. Peace Beyond the Walls of the World? Actually, the Isaiah text does not present the scene as eternal, but as something that is going to happen; its verbs are in the future tense. "The wolf shall lie down with the lamb. . . the lion shall eat hay like the ox . . . a little child shall lead them." In Romans 8, Paul also envisions such a cosmic transformation as a coming event: "the creation itself also will be set free from its slavery to corruption into the freedom of the glory of the children of God." 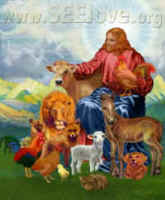 In both passages, human beings lead the way, making it possible for animals to attain this divine peace and fulfillment. Unhappily, there are no clear signs that the great day is approaching. The natural evil of predator attacking prey has not diminished, and the moral evil of human attacking animal, especially for the table, has increased hugely in numbers and descended ever lower in depravity. There is no need to repeat the all-too-familiar statistics running into billions. Why then do we continue to hope for and expect the Peaceable Kingdom? For it is not only evangelical Christians who look to see it realized. 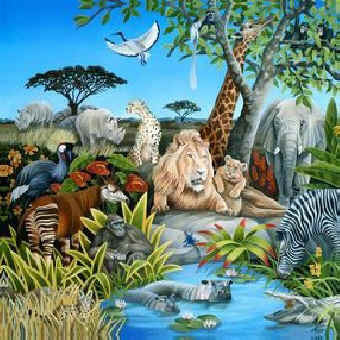 Occasionally other people of faith, influenced by the concept of evolution, have included animals in their hope that ". . . the days are hastening on / By prophet bards foretold, / When with the ever-circling years / Comes round the age of gold. / When peace shall over all the earth / Its ancient splendors fling . . . ."
The animals are waiting for us to move up so they can follow" . . . . This was the answer I had been unconsciously groping for ever since my first confrontation with Africa's wildlife. This surely was why the animals' long, slow stares took us in, unaware that they were waiting for us to "move up" that ladder that Jacob saw in his dream, thronged with angels moving up and down . . . . Assuming that such an evolutionary process is taking place (a large assumption), of what nature might it be? Hulme speaks of it as occurring by the "immutable laws of evolution and involution," which suggests that the change will come about inevitably, whatever we do as individuals, groups, or humanity as a whole. Or might its nature be conditional, perhaps hastened by positive moral and spiritual developments in humanity, slowed by massive evils? It is of course very difficult to speak with certainty about such a matter, which is so much vaster than the scope of our view, whether we think in terms of decades or centuries. Of the various positive human actions that might in fact in fact hasten the process, one that has been put forward is meditation/contemplative prayer, especially when many persons unite in the practice. Mystics from the major religious traditions who engage in meditation/contemplation have sometimes claimed that despite their generally reclusive manner of living, they are influencing the world for the better. As with the effectiveness of prayer overall, certainty on this issue has long been elusive. But since the mid-1970s there has been a long series of social-science experiments in Transcendental Meditation (TM) in groups, which strongly indicate that violence does in fact decrease and movements toward peace and understanding increase (among humans) during the weeks in which large numbers of experienced meditators meet together daily in specific cities. For example: in Washington, D.C. during June and July 1993, meditators gathered, increasing in number over the four weeks until they reached 4,000. Over the same period, violent crime against persons decreased as the number of meditators increased, until it was 23% less than the average for June and July during the preceding five years. (Other variables were controlled.) Afterwards the crime rate returned to "normal." An earlier experiment with fewer meditators was carried out in Providence, Rhode Island, in June of 1978. According to figures cited in The Maharishi Effect, statistics for a number of social ills, including suicide, homicide, robbery, and traffic deaths, changed markedly for the better (other variables being controlled), though they went back to their usual rates after the meditators decamped. It certainly does look as though during the time that many people jointly cultivate unity with the Ultimate, whether seen as God or the Ground of Being, other people in the area become more peaceful. We might even speculate that Oscar, the cat whose self-appointed task is to accompany the dying in Providence's Steere House nursing center (see book review in Oscar ), is a late fruit of residual energies from this experiment; Oscar's ability to perceive the coming of death, and respond supportively, perhaps compassionately, shows him to be at a higher level of spiritual evolution than most. Of course we cannot know with certainty . But in regards to our chief concern, reduction of inter-animal violence, admittedly I know of no studies of the effects of these group meditation experiments on the levels of predation among animals, say wild omnivores. But because all the living are linked in so many ways, it seems quite possible. If omnivores in fact do less killing during these periods, the idea that large-group meditation or contemplation might promote overall spiritual evolution would gain a solider basis. Anything like proof that the Peaceable Kingdom is coming nearer, or that we can hasten it by meditation/contemplative prayer as well as political and social action, is still elusive. There are strong suggestions that such contemplation and meditation have real power to reduce crime and other social evils. But we remain dependent on the visions of mystics, the intuitive gleams of poets, the promises of prophets. And the animals are still waiting.